Come and enjoy the food, drinks, and social time and learn how to become more involved in YPN and our community. This month’s corporate supporters are Greater Muscatine Chamber of Commerce & Industry and Geneva Golf & Country Club. Don’t forget that the membership drive will wrap up at this event, so come and sign up for a membership in 2016 and have a chance to win one of the awesome prizes listed below. You won’t want to miss out on this great prize opportunity! The drawing will take place at this event; you must be present to win. Research Division Engineer – I work with scientists to scale up new or modified products. First they develop them in their laboratory with small experiments, usually about 1 gallon or less. Then we move to the pilot plant where we will do something between 50 gallons and a few thousand gallons depending on the project. If all goes well then I’ll work with production to scale it up further into a commercial product. Along with that, I also size and design new equipment, evaluate costs of commercialization, and investigate new processes. Tie between The Brew and Boonie’s. 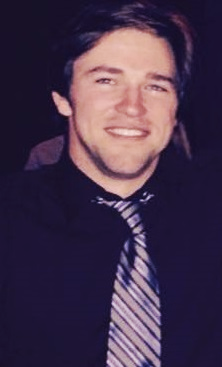 I interned with Walsh Construction and U.S. Steel during college. Ice Hockey (Pearl City Black Storm, we are always looking for more players of all ), Volleyball, Spikeball, Softball, Golf, Snow Ski, any ocean/lake/river related activity, travel anywhere I’ve never been. Why did you join YPN? GPC pays for the membership fees so when I moved here our HR manager told me about it. What’s not to love about free food??!?! Oh, and the meeting people too, I guess. 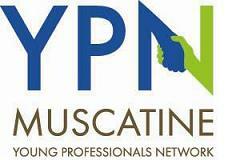 What is your favorite YPN event? 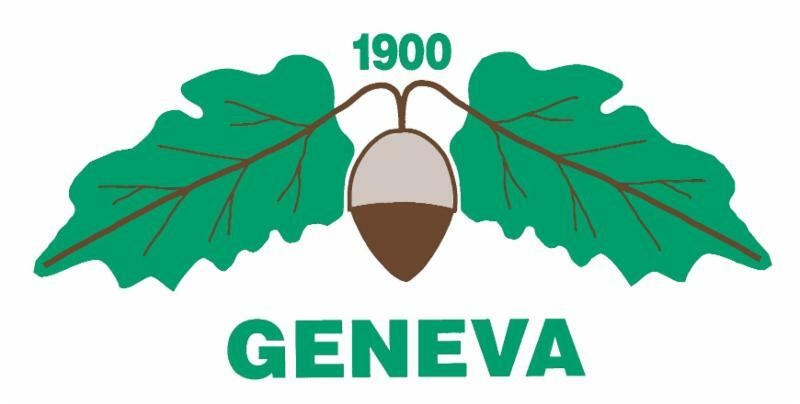 Anything that Geneva caters. Also the Friday night QC Mallards game with $1 beers and $1 hot dogs. What event would you like to see YPN do? Bungee Jumping. Or glow ball at the municipal golf course. I’m good at dog sitting if anyone is going out of town. I work for free if the dog weighs over 50 pounds. Meineke Car Care – 10% off any service, 5% off tires and batteries. Excludes oil changes. Please send your file or flyer submissions in JPEG format. 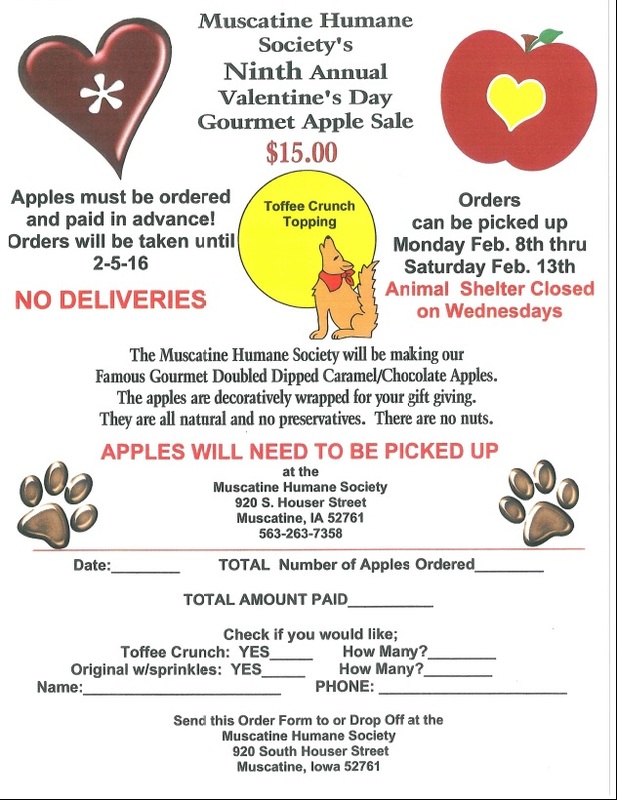 Give your sweet ones a gourmet Apple for Valentine’s Day and donate to the Muscatine Humane Society! Orders for Original and Toffee Crunch Topping gourmet apples are being taken now through February 5th. Cost is $15 per apple. Sorry, no deliveries! Orders can be picked up from the Humane Society, at 920 S. Houser Street, starting Monday, February 8th through Saturday, February 13th. Animal Shelter closed on Wednesdays! For more information, contact the Muscatine Humane Society at 563-263-7358. Here’s an opportunity for others to learn about you and your business and to join GMCCI! Reserve a table for $25 and be ready to talk about your business at the Chamber’s Business After Hours Event on Thursday, January 14th from 5:00 to 7:00pm held at Muscatine Municipal Golf Course, 1820 Hwy 38. All new businesses will be entered into a drawing for a Free Membership for one year. Those that join, we’ll apply the $25 entry fee to your first year’s dues. To reserve your table, contact GMCCI at 563-263-8895 or moc.enitacsumnull@worromj. Interested in donating a cake for the Muskie Booster Club’s biggest fundraiser – the Annual Cake Auction? The 26th Annual Cake Auction will be held on Friday, January 29th as they host a Girls/Boys Doubleheader basketball game against Davenport Central! Our theme this year is “Super Heroes.” Complete the entry form and return to MHS, Attn: Boosters, 2705 Cedar Street, Muscatine by Friday, January 15th. If you have any questions, please contact the Student Activities office at 263-6141 or the Cake Auction Chair, Sara Carlson at 563-506-0241 or moc.semohlhurnull@noslracaras. Come discover the opportunities that Muscatine businesses offer for us to live healthy! 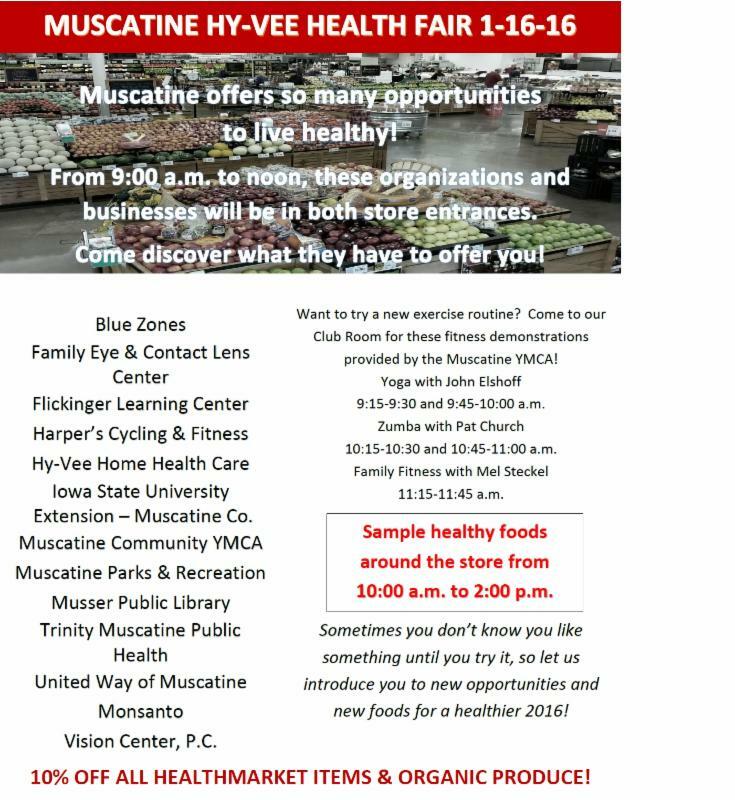 Muscatine Hy-Vee, 2400 Second Avenue, is hosting a health fair on Saturday, January 16th from 9:00am to 2:00pm. Muscatine businesses will be available from 9:00am to Noon near both store entrances. Come to the Club Room and experience fitness demonstrations starting at 9:15am and ending a 11:45am. Sample healthy foods around the store from 10:00am to 2:00pm. Don’t miss your chance to help stick with your New Year’s Resolution! Join a Ladder League on Monday or Wednesday nights from 8:00 – 9:30pm at the Affordable Metal Barn, behind Wendy’s. 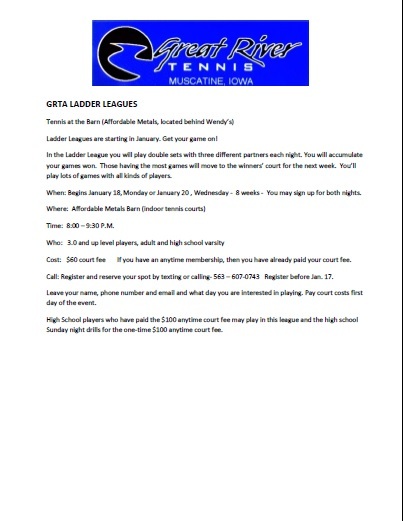 Leagues start Monday, January 18th or Wednesday, January 20th and go for 8 weeks. You may sign up for both nights! Leagues designed for 3.0 and up level players, adult and high school varsity. Cost is $60 for court fee or a $100 anytime court fee. Registration required by January 17th by calling or texting 563-607-0743. 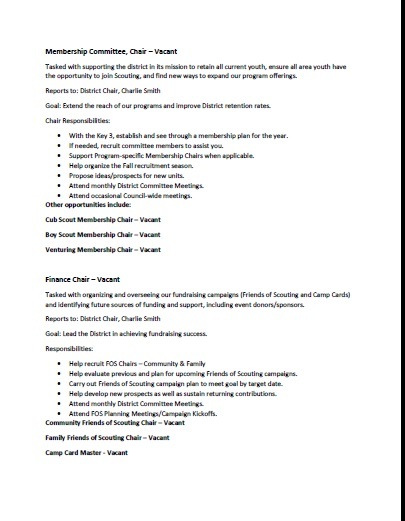 Please leave your name, phone #, email address and day interested in joining. Court costs due first day! Come explore opportunities for Muscatine Small Business & Startups on Tuesday, January 19th from 5:30 to 8:30pm at the Riverview Center. Gregg Mandsager, our City Administrator, will be presenting programs available. 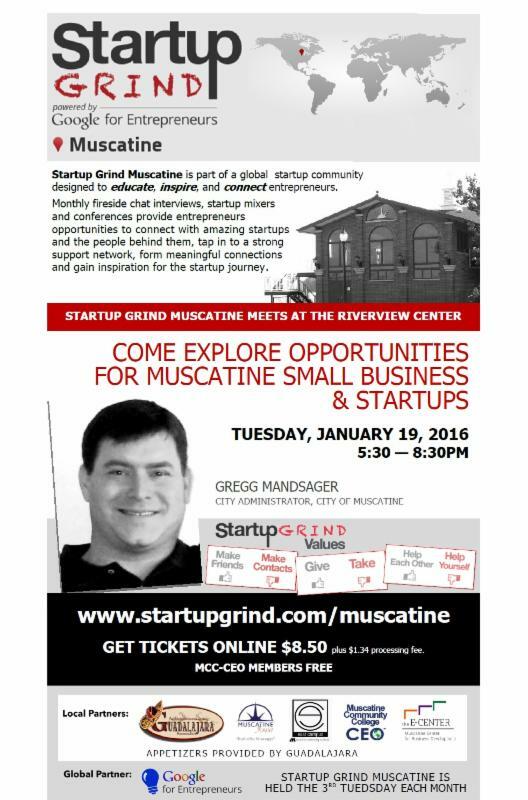 Go to www.startupgrind.com/muscatine for tickets ($8.50 + $1.34 processing fee). MCC-CEO members are free. Appetizers provided by Guadalajara. Support United Way and enjoy Boonie’s too! 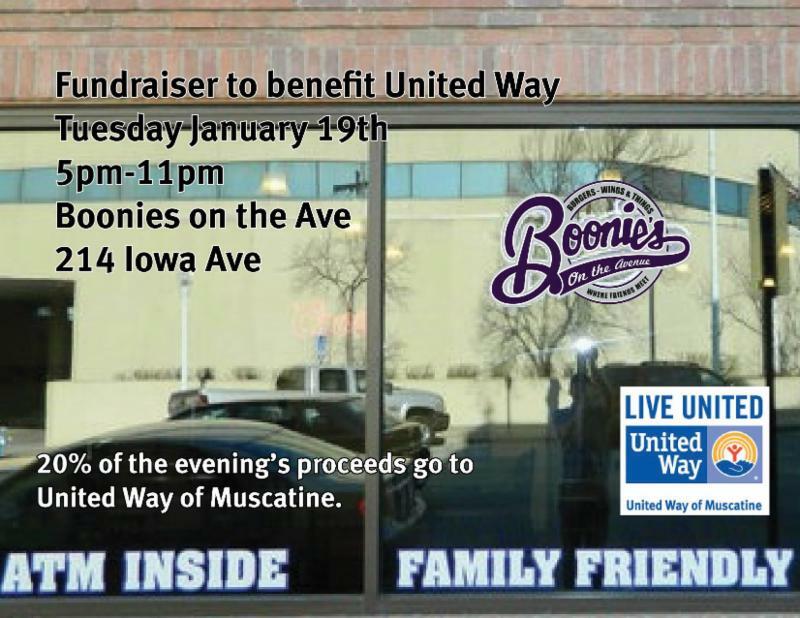 Dine or meet your friends at Boonie’s on the Avenue, 214 Iowa Ave, from 5pm to 11pm on Tuesday, January 19th, when 20% of the evening’s proceeds will go to United Way of Muscatine! Looking for extra income and a flexible job? 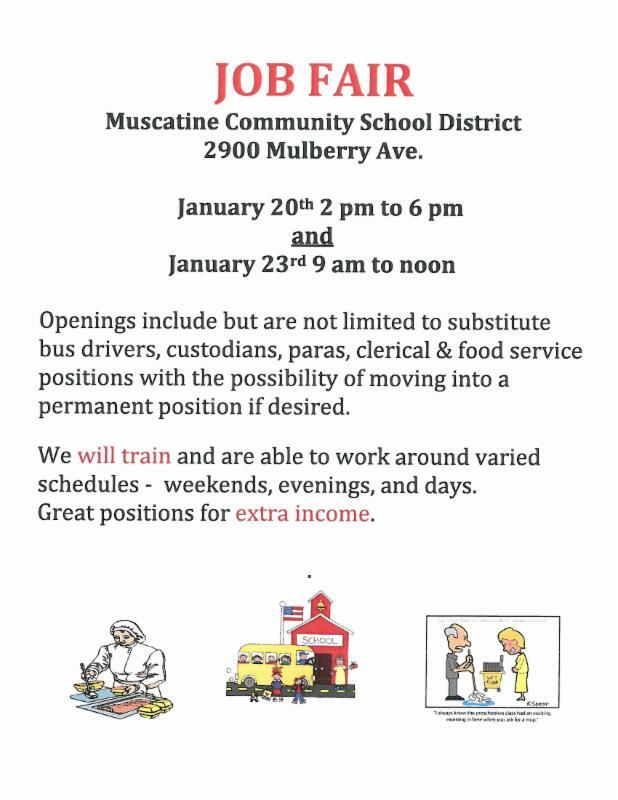 The Muscatine Community School District is having a Job Fair on Wednesday, January 20th from 2:00pm – 6:00pm and Saturday, January 23rd from 9:00am to Noon. Openings include sub bus drivers, custodians, paras, clerical and food service to name a few. Training may be held on days, evenings, and weekends if needed. 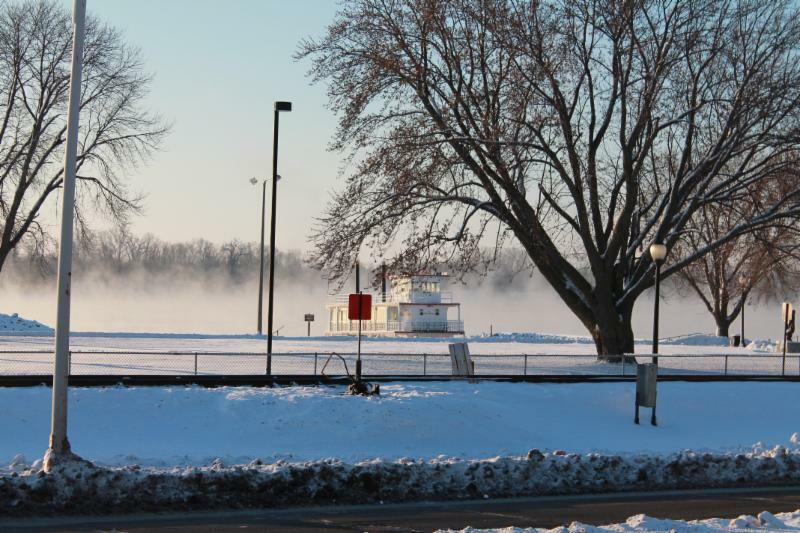 Jan. 23: Eagle Watch at Riverfront – Note Change in Date! 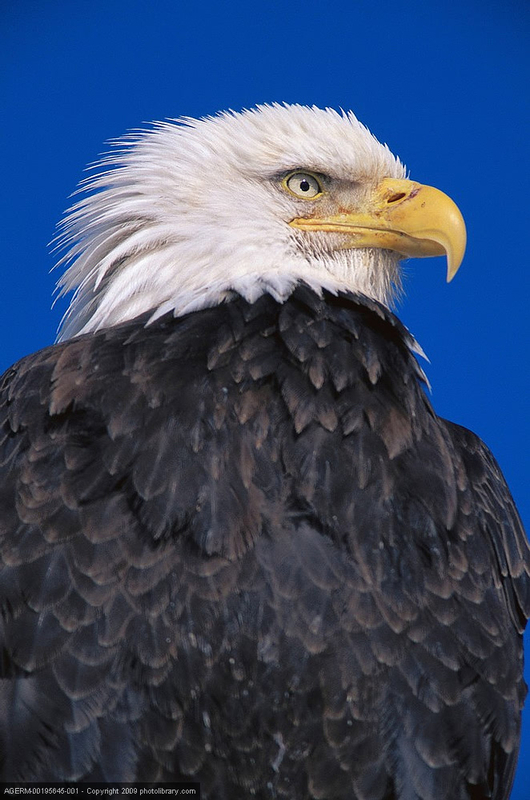 The Eagle Watch at the Riverfront, part of the Eagles and Ivories Ragtime Weekend, will be held on Saturday, January 23rd from 9am – 3pm at the riverfront. Please note that this is the Saturday prior to the Eagles and Ivories Ragtime weekend. Sorry for the confusion! Come and enjoy the musical gifts from a variety of ensembles from the Muscatine Symphony Orchestra on Sunday, January 24th from 2:00 – 4:00pm at SunnyBrook, 3515 Diana Queen Drive. Light refreshments will be served. Thank you in advance for your continued financial support of this musical treasure. 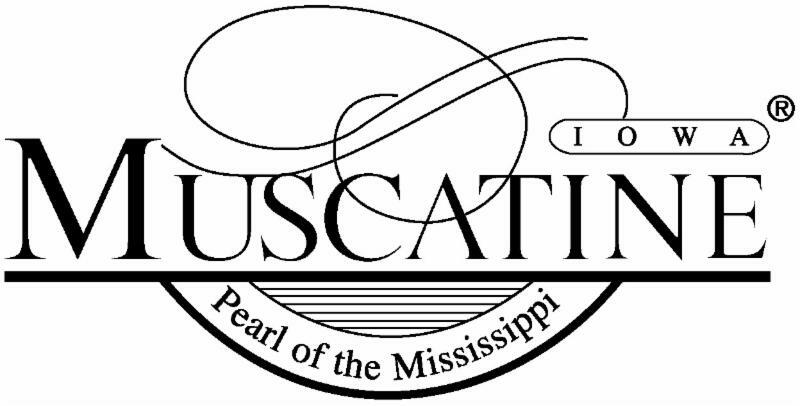 For more information, please visit: muscatinesymphony.org. Struggling with your laptop, tablet, or smart phone? Here’s an opportunity for some hands on training! Bring your equipment and join us on Wednesday, January 27th from 6:00 – 7:30pm at First National Bank’s Walnut Room, corner of 2nd and Walnut. 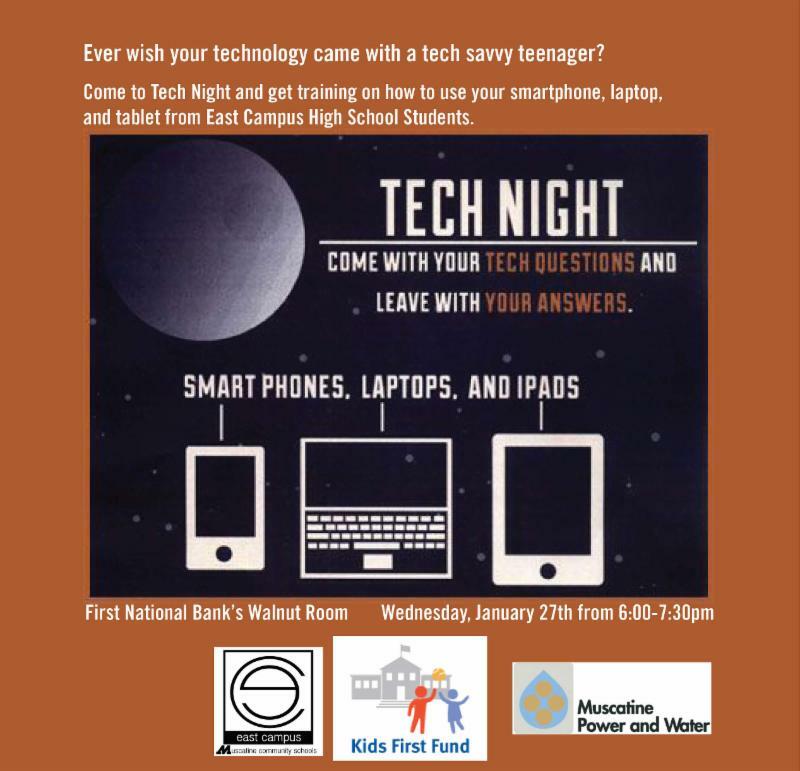 East Campus High School Students will help answer your questions and show you how to operate them. Help support the Kids First Fund and enjoy pancakes, eggs and sausage! 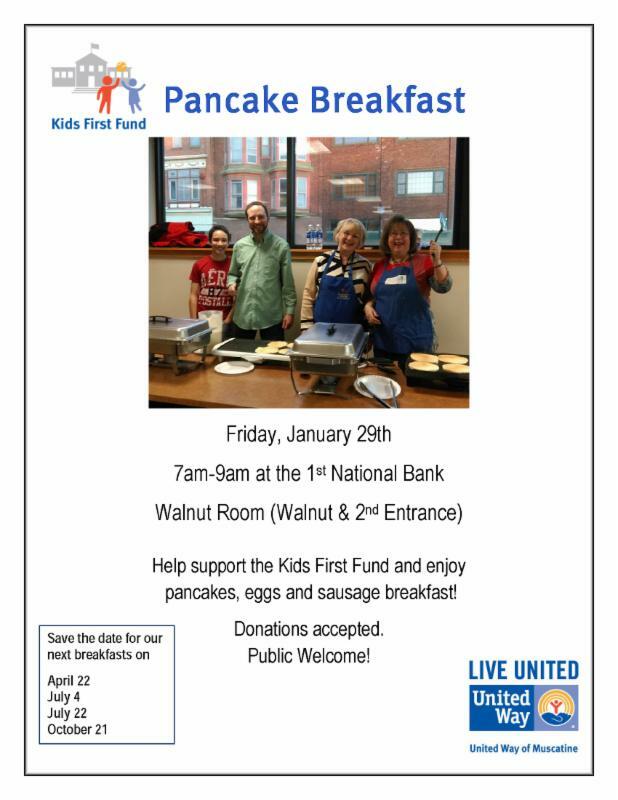 Come hungry on Friday, January 29th from 7:00am to 9am at First National Bank’s Walnut Room, corner of Walnut and 2nd Street. Donations gladly accepted! 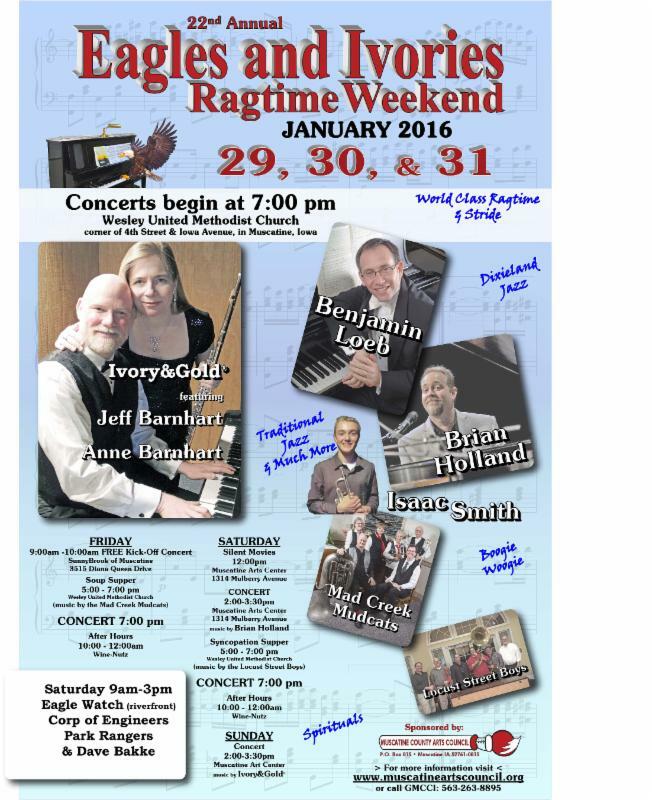 Don’t miss the numerous concerts, movies, suppers, and after hours events starting at 9am on Friday, January 29th and ending at 3:30pm on Sunday, January 31st in celebration of the Eagles and Ivories Ragtime Weekend. Concerts feature Jeff and Anne Barnhart, Benjamin Loeb, Brian Holland, Isaac Smith, Mad Creek Mudcats, the Locust Street Boys and much more! For more information, call David Ales at 563-263-9978 or visit www.muscatineartscouncil.org. Please note that the Eagle Watch on the Riverfront date has been changed to Saturday, January 23rd from 9am – 3pm. 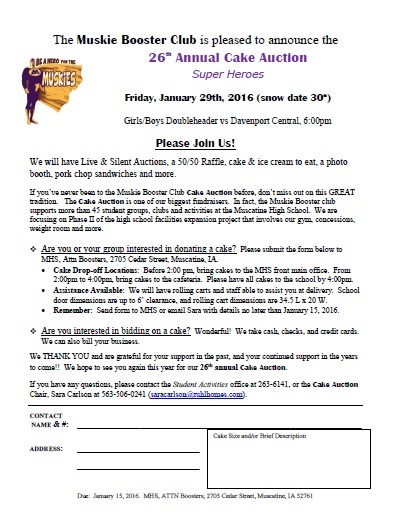 “Be A Hero for the Muskies” The big event will be held on Friday, January 29, 2016 (rain date 30th) starting with a 6pm with a doubleheader Girl’s and Boy’s Basketball game against Davenport Central. This years theme is Super Heros and will include live and silent auctions, photo booth, 50/50 raffle, and of course, cake & ice cream. 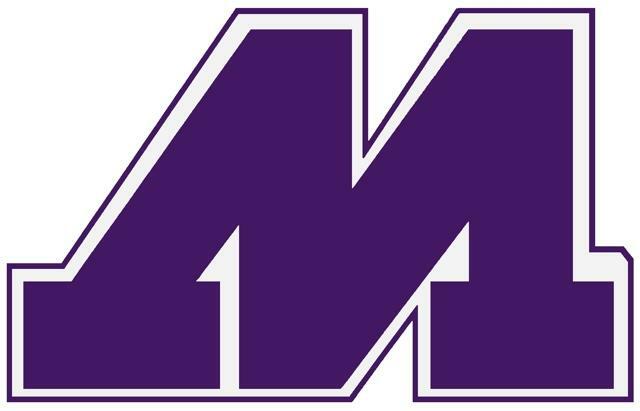 Support the Muskie Boosters by contributing to their largest fundraiser of the year. Projects include phase II expansion of MHS for the gym, concessions, weight room and more! For more information, contact Sara Carlson, 563-506-0241 or moc.semohlhurnull@noslracaras. 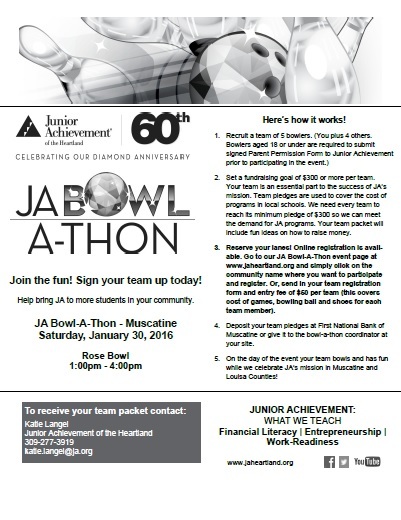 Help bring Junior Achievement to more schools and students in our community by participating in the Muscatine JA-Bowl-A-Thon to be held on Saturday, January 30th, from 1 – 4pm at the Rose Bowl, 1411 Grandview Avenue. Recruit a team of 5 bowlers and set a fundraising goal of $300 or more! For more information on putting together a team, contact Katie Langel at 309-277-3919, gro.ajnull@legnal.eitak or visit www.jaheartland.org. To register online, visit: jaheartland.org. 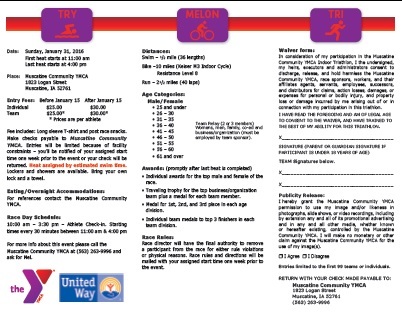 Muscatine YMCA is having their annual “Try Melon Tri” Indoor Triathlon on Sunday, January 31st with first heat at 11am and last heat at 4pm. Triathlon consists of a 1/2 mile swim, 10 mile bike ride, and 2 1/2 mile run. Entry fees are $24 if registered by January 15th, thereafter $30. Sponsors of the event may have teams of 2 and 3 participating. Visit: www.muscatiney.org to register or get more details. Mark your calendars for Sunday, January 31st and gather your trivia teams of eight! 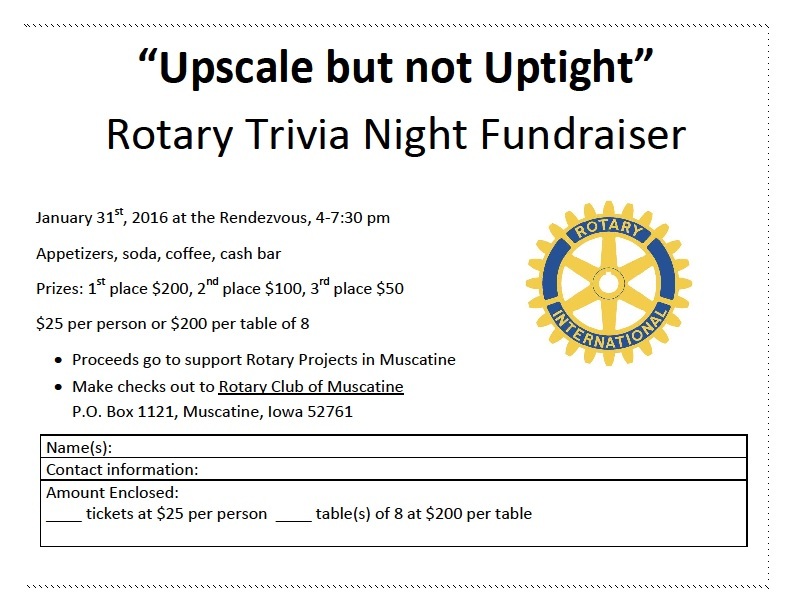 The Rotary Club of Muscatine will be hosting a Trivia Night Fundraiser where the proceeds go directly to the Rotary projects in Muscatine. Event will be held on Sunday, January 31st from 4:00pm – 7:30pm at the Rendezvous, 3127 Lucas Street. $25 per person or $200 for table of eight. Don’t worry if you don’t have a team of 8, we’ll help assemble teams too! Save the date of Febuary 2nd! Have a marketable idea and not sure how to get it going? Come join us at the E-Center on the MCC campus, Loper Hall, at 5:30pm and learn about the six week Venture School opportunity available to you! For more information, please visit: http://tinyurl.com/eiccVS16. 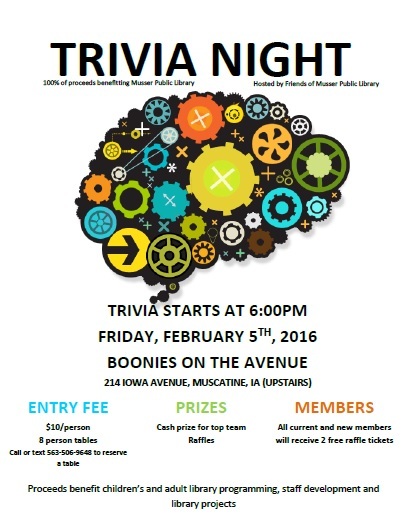 The Friends of Musser Public Library are hosting a Trivia Night on Friday, February 5th starting at 6:00pm at Boonie’s on the Avenue, upstairs, 214 Iowa Avenue. Entry fee is $10 per person, teams of 8 per table. Come join us for the fun, cash prizes and raffles. 100% of proceeds benefit the Musser Public Library programs for children, adults, staff development and library projects. For more information on Musser Public Library, visit musserpubliclibrary.org. 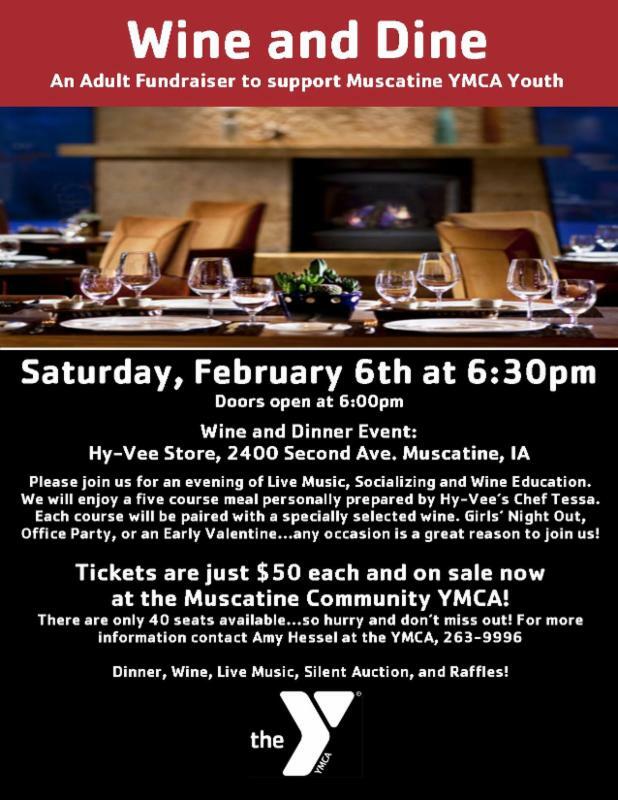 Join us for an adult evening featuring live music, dinner, wine education, silent auction and raffles on Saturday, February 6th at Muscatine Hy-Vee’s Club Room, 2400 Second Avenue! Doors open at 6:00pm and the event kicks off at 6:30pm. Seating is limited to 40 seats, so purchase your tickets at the YMCA now. Tickets are $50 each. Contact Amy Hessel at the YMCA at 563-263-9996 for more information. 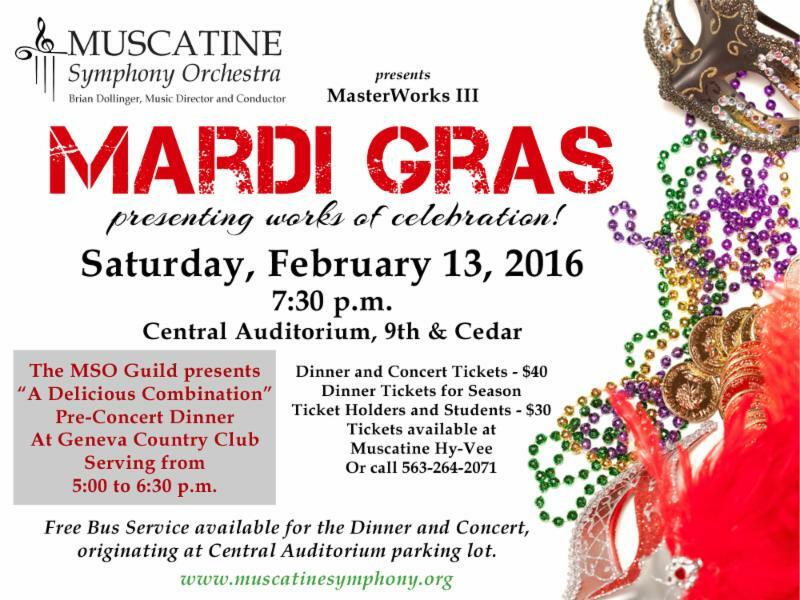 The Muscatine Symphony Orchestra presents “Mardi Gras” on Saturday, February 13th at Central Auditorium on 9th and Cedar Streets. Show begins at 7:30pm. The MSO Guild is offering a “Delicious Combination” of a pre-concert Dinner at Geneva Golf and Country Club, 3100 Bidwell Road, from 5:00pm to 6:30pm. Dinner and concert tickets are $40, Season Ticket holders and students are $30. Tickets are available at Muscatine Hy-Vee or by calling 563.264.2071. Free Bus service available for Dinner and Concert, originating at Central Auditorium parking lot. 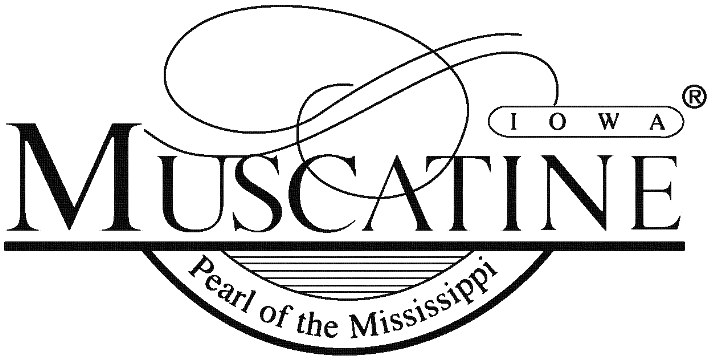 For more information, please visit: www.muscatinesymphony.org. Get your trivia team together and join us for a fun evening! 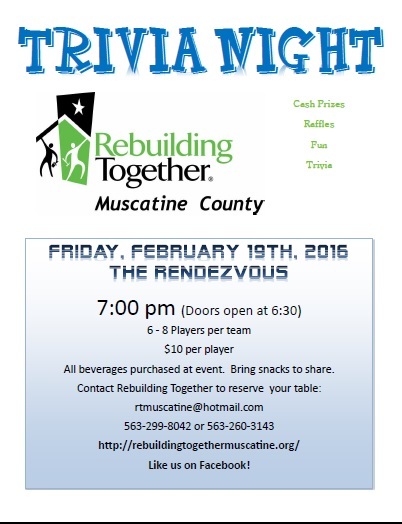 Rebuilding Together is having a Trivia Night featuring cash prizes, raffles and much more on Friday, February 19th starting at 7:00pm at the Rendezvous, 3127 Lucas Street. Admission is $10 per player. All beverages purchased during event. Bring snacks to share and reserve your table at moc.liamtohnull@enitacsumtr or call 563-299-8042 or 563-260-3143. For more information on Rebuilding Together Muscatine County, visit http://rebuildingtogethermuscatine.org. Save the Date! 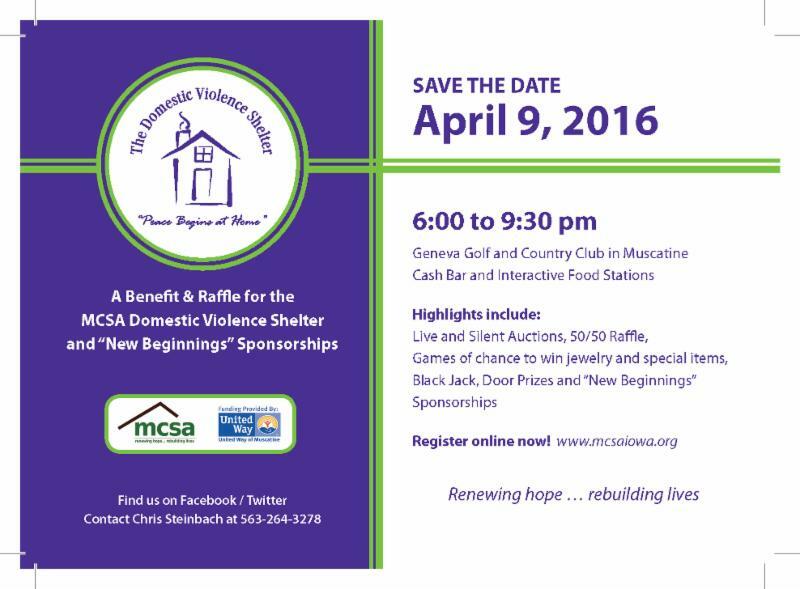 On April 9th from 6:00 – 9:00pm at Geneva Golf and Country Club, MCSA’s is having a benefit and raffle for the Domestic Violence Shelter and “New Beginnings” sponsorships. There will be live and silent auctions, 50/50 Raffle, games of chance of win jewelry and special items, Black Jack, door prizes and more! For more information, contact Chris Steinbach at 563-264-3278. Register for sponsorships online at www.mcsaiowa.org. The Community Foundation of Greater Muscatine is pleased to invite area nonprofits to apply for grants from the Muscatine County Endowment Re-granting program. Organizations or individuals with projects serving any part of Muscatine County are welcome to apply. Community Foundation staff are available to help organizations determine if their project or program is potentially a good match for funding. Application forms and eligibility requirements are found on the Community Foundation of Greater Muscatine’s website at www.muscatinecommunityfoundation.org. Deadline to submit application is January 15th. 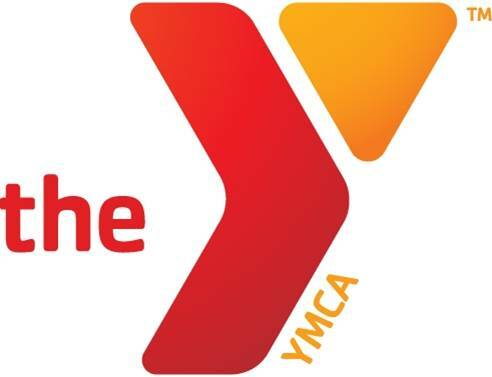 The Muscatine Community YMCA is working with YMCA of the USA, our national office, to conduct a community needs assessment. Based on this community needs assessment, the Y will design and deliver new programs and services that address critical issues in the areas of youth development, healthy living, and social responsibility. We need your help in completing a survey that will take approximately 5 minutes to complete. Responses are not individually tracked and are kept confidential. Please click Survey to complete. Special programs connected to the Framed: Step into Art™ exhibit include Family Day events offered one Saturday each month – January 23rd, February 20th, March 19th, and April 16th. Crafts and snacks will be provided from 1:30 -2:30 pm on those days. Admission is always free. 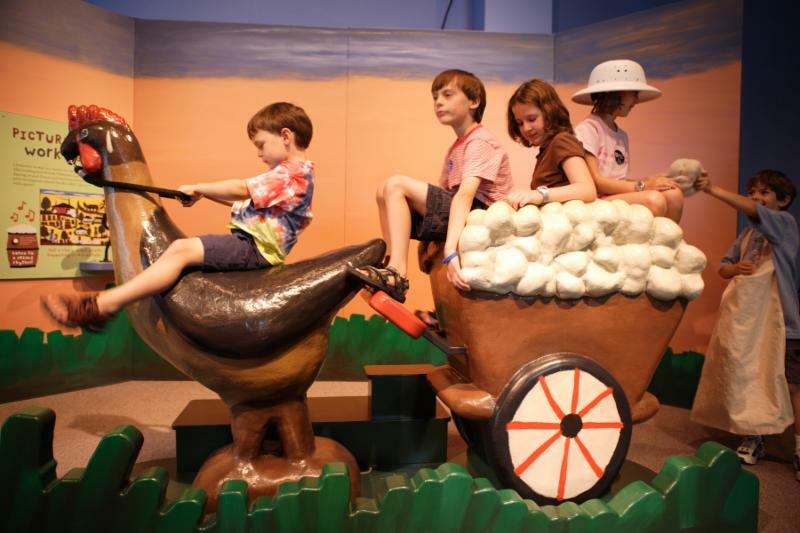 Programming developed for children ages 2 to 5 in “For Tots” will be tailored to the exhibit throughout the month of February. 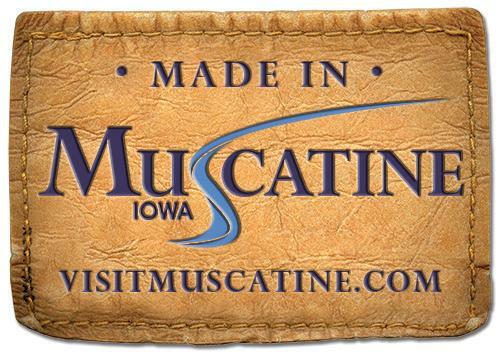 The Muscatine Art Center is located at 1314 Mulberry Avenue in Muscatine, Iowa. Hours are Tuesday through Friday from 10:00 a.m. to 5:00 p.m., Thursday evenings until 7:00 p.m., and Saturday and Sunday from 1:00 to 5:00 p.m. Admission is free. Donations are appreciated. Visit www.muscatineartcenter.org for more information. 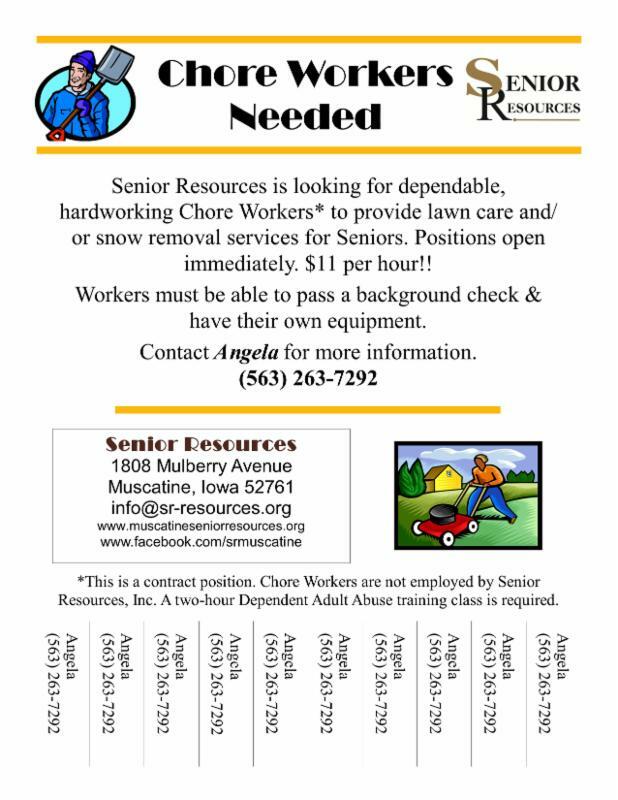 Senior Resources is looking for contract workers to provide snow removal and lawn care services for Seniors. $11 per hour and immediate openings are available. Must be able to pass background check, have your own equipment and attend a two hour Dependent Adult Abuse Training class. Contact Angela for more information at 563-263-7292. 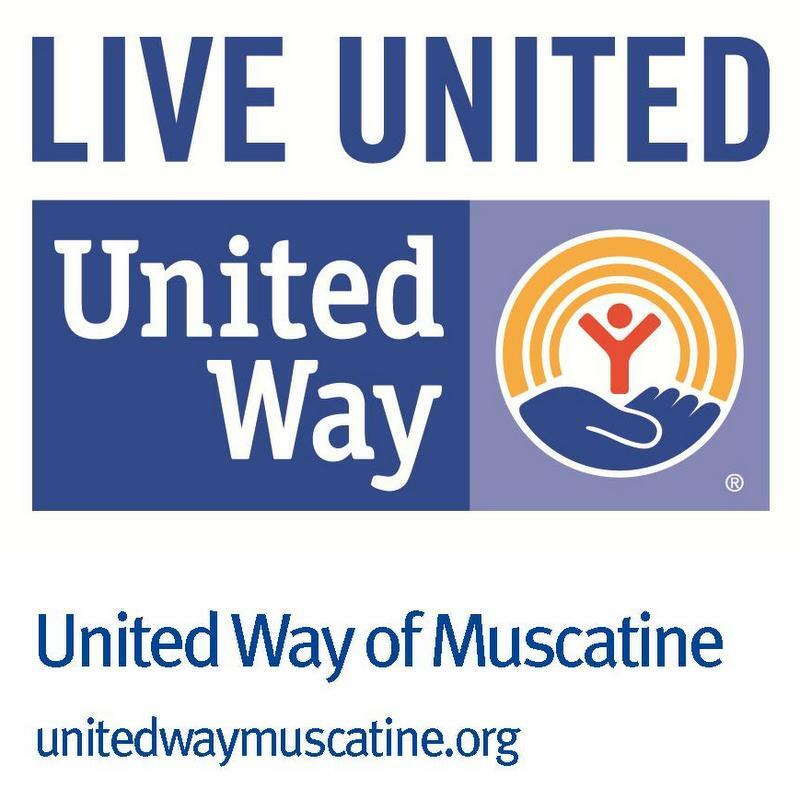 Iowa College Student Aid Commission (Iowa College Aid) has announced that United Way of Muscatine was awarded a $10,000 Planning grant to support efforts to increase the college attainment rate in Muscatine as part of the agency’s “College Changes Everything” initiative. For Press Release and more information, visit unitedwaymuscatine.org. 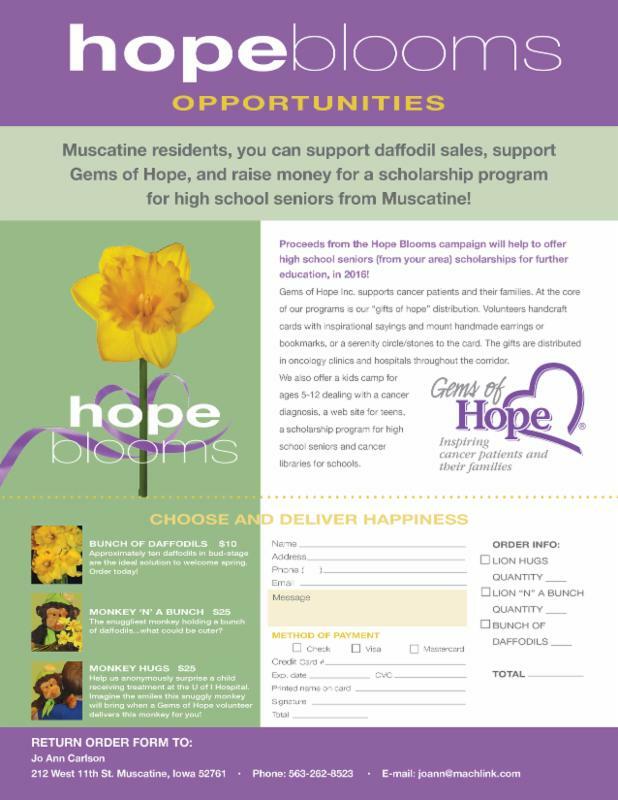 Help support daffodil sales, Gems of Hope and raise money for a scholarship program for high school students. Consider choosing to deliver happiness to oncology clinics and hospitals! See order form or contact Jo Ann Carlson at 563-262-8523 or moc.knilhcamnull@nnaoj for more information. The Volunteer Centers of Iowa (VCI), in partnership with the Iowa Commission on Volunteer Service, will be hosting a web-based training resource for Iowa nonprofit, public, faith-based, and service organizations. 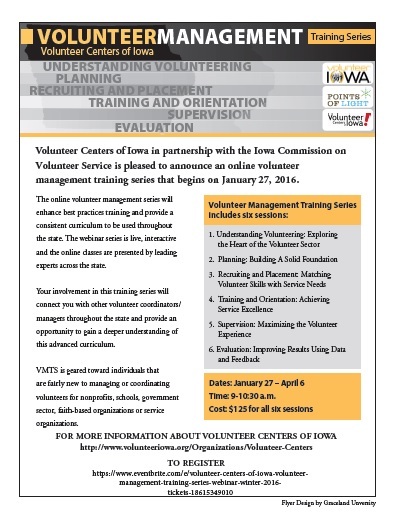 The six session VCI Volunteer Management Training Series, running January 27th through April 6, 2016, will provide best practices training presented by leading experts from across the state. Cost is $125 for all six sessions. For more information about Volunteer Centers of Iowa, visit www.volunteeriowa.org. 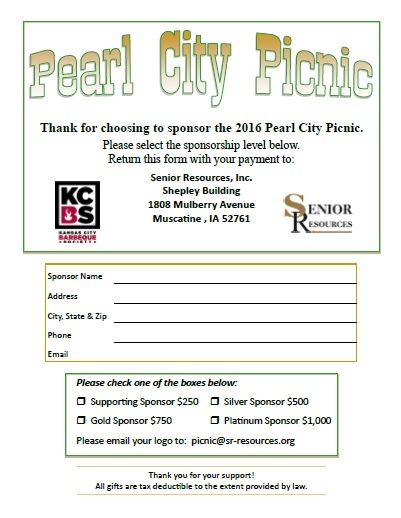 Senior Resources is seeking sponsors for the spring fundraiser, Pearl City Picnic on Saturday, May 14th, 2016. This year, the event will be sanctioned by the Kansas City Barbecue Society and will have great visibility for sponsors. Funds raised from this event will go directly to the senior citizens in Muscatine county. For more information on this event, please visit www.muscatineseniorresources.com. The Boy Scouts of America relies on dedicated volunteers to promote its mission of preparing young people to make ethical and moral choices over their lifetime. Through the dedication of these many volunteers, the Boy Scouts of America remains the foremost youth program of character and citizenship development, values-based leadership and personal fitness. Please see enclosed flyer for volunteers needed. For more information on Boy Scouts, please visit: www.scouting.org. Gilda’s Club and CCKMA are teaming up to present four $1,000 scholarships to students impacted by cancer – whether it is themselves, a parent, sibling, relative or friend. Students must be high school juniors/seniors or in first of second year of college to apply. Accepting applications now through February 1st, 2016. 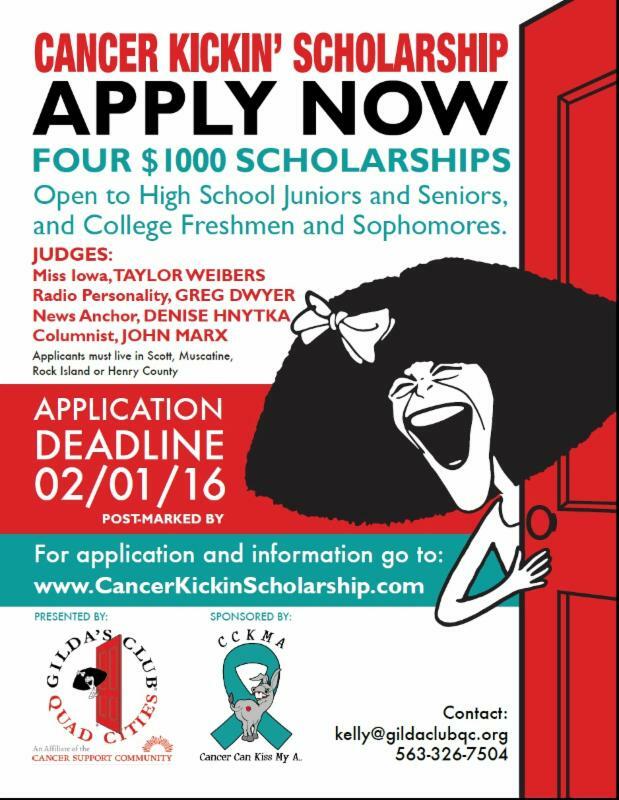 Applications are available online at cancerkickinscholarship.com, at Gilda’s Club in Davenport, or by calling Kelly Hendershot at 563-326-7504.